Amazon has finally launched its DRM-free music store in the UK, with over 3 million tunes to choose from already online. Amazon's MP3 files are encoded at 256Kbps and tracks cost from a mere 59p, with entire albums costing you anything from £3 and up. 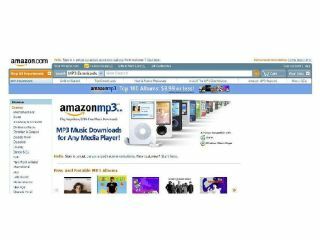 The 'Amazon Downloader' software will transfer the tunes you buy to your Windows Media Player or iTunes libraries. Easy! Amazon has signed up all the major labels - Sony BMG, Universal Music, EMI Music and Warner Music – and a bunch of indies including Cooking Vinyl, Harmonia Mundi, Beggars Banquet, The Orchard, Concord and Ioda. Apple's iTunes is increasingly looking like the less exciting option out there for purchasing music online. Check it out now at Amazon MP3.